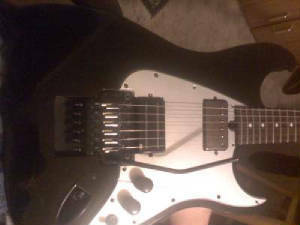 Floyd Rose DST-2 w/ Bill Lawrence L-900 (OBL L-900 West Germany version) Humbucker installed. So I have played it a bit, and I like both pickups. The GFS Fat Pat makes a nice neck pickup (i'm using the bridge version, howver in the neck, because the Bill Lawrence (OBL L900XL) is pretty high out put. The Fat Pat gives a fairly high amount of ouput and enough bass and clarity to help compenste for the trebly sounding OBL (not to say the OBL lacks low end, it doesn't, but it has a lot of high end). If I were to do it all over, I would seriously consider getting a pair of chrome humbuckers from Dragonfire or Guitarheads instead of GFS. Because they charge half as much. I would also consider their rails pickups, and I would like to try them and compare to the Bill Lawrence. But I am pretty happy overall with the sound these pups give. OBL in the bridge, Fat Pat in the neck. Plenty crunch in the bridge and tone in the neck. THey help make up for the basswood's flat tonal characteristics. I have a brand new BIll Lawrence (Wilde Pickups) L500XL on the way here from Bill and Becky (Wilde Designs). I will put that in the Floyde Rose Redmond Series K guitar. Still trying to decide on a neck pup, might use the old SG BUlly bridge pup. It's high output and bassy sounding, which would make it a good complement to the Wilde L-900XL. I finally got around to installing this bad boy. I have not tuned the guitar and started playing it yet. I plugges it in really quick; yes it souns high output and seems to be ptretty trebly/high end sounding. Here are some pics for now. I will play it some more and post again here in the next few days. Anyway, the GFS Fat Pat is supposed to be BASSY (kind of), and therefore should be a good neck pickup to counter the trebly tendancies of the OBL L-900. So yeah; I will get back and post reviews on the PUPs within a few days or so.